Hi there! About two months ago I got two Naturtint samples – Naturtint Shampoo and Naturtint Nutrideep Multiplier Protective Cream. The shampoo claims to moisturise and to strengthen hair, while the protective cream claims to condition hair and to protect it from breakage. As I said, these two bottles are sample sizes. They don’t state how much product is in them. But I compared the size of the bottles with similarly-sized mini bottles I’ve got. And I think these are 40ml bottles. Now let’s get to the products! 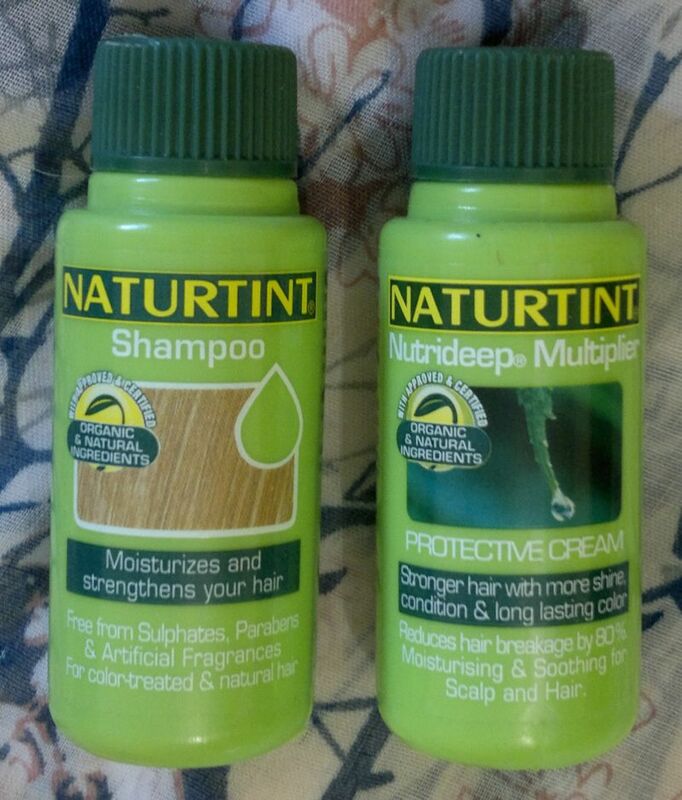 Naturtint Shampoo was nothing special. It was very runny, it hardly smelled of anything and it didn’t lather up well. It cleansed my hair and my scalp OK. But I’d prefer a supermarket own-brand shampoo any day. I used this shampoo four times only (that’s what I got out of the small bottle), but I’m satisfied I don’t need to buy a full-size bottle for myself. Naturtint Nutrideep Multiplier Protective Cream wasn’t great at all. It looked like a regular conditioner. But as soon as it touched my hair, it shrunk to a weird soapy nothingness (I had to use up the entire bottle in one go). The product felt very drying and uncomfortable. And I didn’t even try to detangle my hair. But I left the product on for two minutes as per the instructions on the bottle and then I rinsed it out. What happened then? I slathered my hair in L’Oréal’s deep conditioner to restore it to its pre-Naturtint state. That’s because after rinsing out the Naturtint, my hair was a dry, straw-like mess with zero elasticity. It was horrible. I didn’t even know it was possible that my hair could feel like this! This Naturtint product is, without question, the worst I’ve ever used on my hair – it even beats the Naked Colour conditioner (which I think was rubbish). Honestly, I don’t know what this product is good for. It’s not only not conditioning, it felt like it’s anti-conditioning. And what purpose does it really serve when you need a deep conditioner to restore your hair to normal after using this product? I wouldn’t recommend these Naturtint products. However, if you’re interested, the full-size bottles (150 ml) are available for between £5 and £10 each (depending on where you shop). Hi there! I found this oldie The Body Shop Lychee Blossom Body Mist the other day. And I think now’s the time to finally use it up. I’m not sure how old it is, but it still smells yummy. OK, so this body mist promises freshness and a sparkling, energetic scent. Is it like that? Well, almost. In my opinion this body mist smells more of lychee fruits than of lychee blossoms. It smells sweet, fruity and juicy, but I wouldn’t necessarily say it’s fresh. While it’s not cloying or overpowering, it’s certainly not anywhere near as fresh as lemon or grapefruit fragrances or body mists. I would still say this body mist would be great for spring and summer as it is not too sweet. It’s also not very intense, so I can douse myself in it every two or three hours without smelling like a perfume store. I generally prefer my fragrances to last longer than that, but I don’t mind that body mists are not as longlasting. They’re obviously meant to be short-lived fragrant refreshments. But here’s the bad news: The Body Shop Lychee Blossom Body Mist was part of a limited edition collection, so it’s no longer available. If you really, really want a lychee fragrance, you have to look for something else. Hi there! Today’s review is about Thierry Mugler’s Cologne (which I have several samples of). And in the spirit of using my samples, I’ve now been wearing this fragrance for a few days. OK, before we start, Mugler Cologne contains the following notes: bergamot, neroli, petitgrain, orange blossom, ‘S’ molecule and white musk. There’s a question mark behind the ‘S’ molecule – apparently it’s a super secret fragrant molecule. Mugler Cologne is all about bergamots and orange flowers. It’s a classic (some would say old-fashioned) cologne scent. It’s not the most original fragrance, but it’s well done. It’s pure, fresh and clean – definitely a good choice for spring and summer – and I think it’s perfectly unisex. If you love the scent of classic colognes and bergamots, you’d probably like Mugler Cologne which is available as 100ml for around £30. Hi there!Today I’ve got another lipstick to review. It’s MUA MakeUp Academy Matte Lipstick Wild Berry. 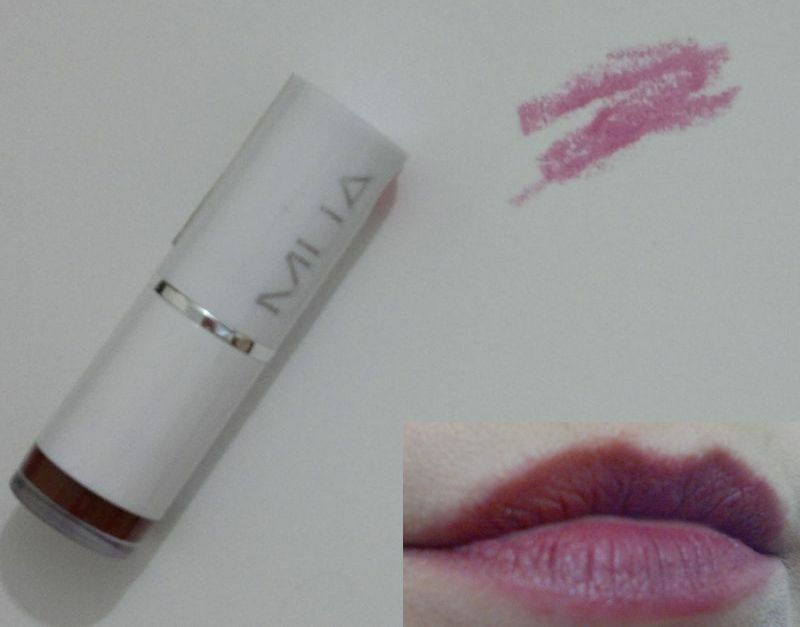 I’ve previously reviewed a matte lipstick from MUA – and I wasn’t impressed. And unfortunately today’s review isn’t a positive one either. Now let me tell you why I’ve already binned this lipstick. First of all, I don’t like how the lipstick applies and how it feels on my lips. The formula is thick and waxy, the colour doesn’t transfer well onto the lips, and the lipstick feels drying and sticky at the same time. I also don’t love the colour. It looks like a dark berry colour in the bullet. But it’s a fuchsia / plum shade on the lips. The colour pay-off isn’t that great either. I’ve got a white spot on my bottom lip (it’s just a lack of pigment). Most lipsticks cover this small area easily, so it was quite a disappointment that this lipstick didn’t. MUA MakeUp Academy Matte Lipstick in Wild Berry is available for £1 (Superdrug, MUA online store). Hi there! About two months ago I bought quite a few NSPA products. I’ve already reviewed the wonderful Orient fragrance, and now’s the time to take a closer look at NSPA Caramel Fudge Shower & Bath Gel. I really like the thick texture of this shower & bath gel because I can’t spill it by accident. And the shimmering gel in golden and caramel hues looks very pretty. The gel lathers up nicely and it smells absolutely delicious. 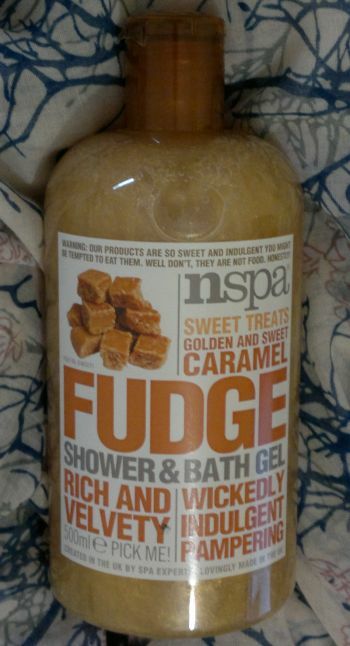 NSPA did a really good job creating an authentic caramel fudge fragrance. Another good thing is that this shower & bath gel doesn’t dry out my skin. It really feels rich and velvety – just as it says on the bottle. NSPA Caramel Fudge Shower & Bath Gel a limited edition product. It’s only £2 for a huge 500ml bottle. My local Asda has lots of stock left, so yours might too! Hi there! 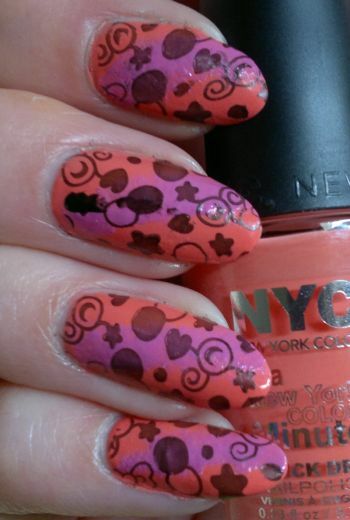 The other day I painted my nails with one of my new polishes – NYC In A Minute 027 Love Match. Anyway, I was bored of the orange polish quickly – I’d say it was around the time I was applying the second coat. So I sponged on NYC In A Minute 264 Lincoln Square Lavender in vertical lines. I really like this polish – the colour is lovely and the formula is great and easy to work with. OK, there I was – still without an idea on what to do with this half-hearted attempt at a manicure. So I picked Pueen’s 82 plate from Pueen’s Buffet Leisure stamping plates set. I opted for an image featuring stars, hearts and circles. The black polish I used to stamp on the images is NYC In A Minute 001 Evil. Everything went well until my midle finger had an unfortunate run-in with a blob of black polish – which essentially ruined the image. And when I tried to save the image, I ruined another one (I’m glad you can’t see my thumb!). 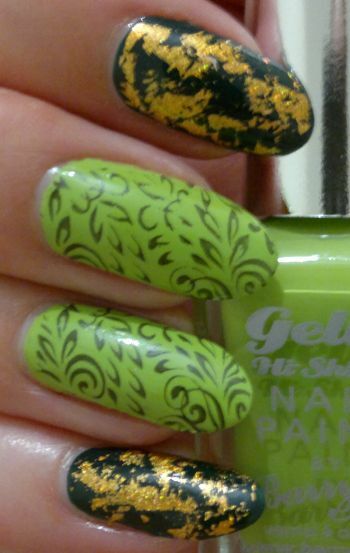 Ah well, it’s certainly not the worst mani – but I wish I could have avoided the blob accident.